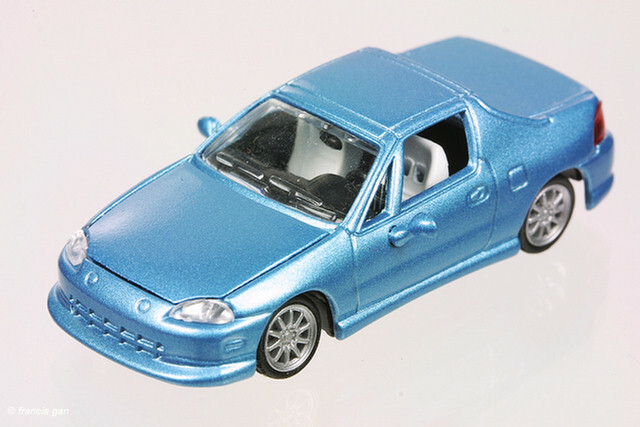 Modifiers has released a number of 1:64 Civics, Integras and Accords since 2002 and finally a Del Sol in a 1:43 and 1:64 combo kit. xConcepts just recently released Series 1 of their new "Modifiers Model Car Kit" pairs of 1:43 and 1:64 models. In Series 1 are 3 Honda/Acura models: the 1993 Acura Integra LS, the1997 Honda Del Sol (power blue metallic w/black interior) and the 1998 Honda Civic Hatchback. So far, these cars seem to be available only in a single color per model. Both the 1:43 and 1:64 models are the same color. The kits come in a blue and yellow windowed box - showing the painted metal bodies of both scale models. The wheels and tires are also visible. The assembly of the 1:64 model is straightforward - though the instructions don't really apply. On the Del Sol, the supplied strut tower bar was not wide enough for the mounting points. Additional springs were included but a few required short screws were missing. Good thing I had a supply leftover from previous kits. The tires are directional and if you are picky should be installed the correct way. 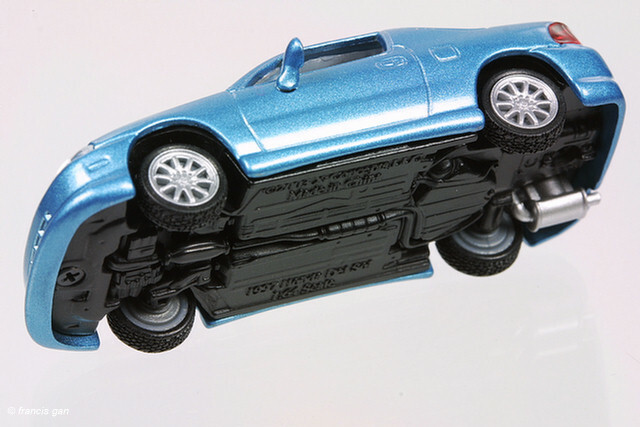 As with all the 1:64 and 1:43 modifiers, the suspension height was adjustable. 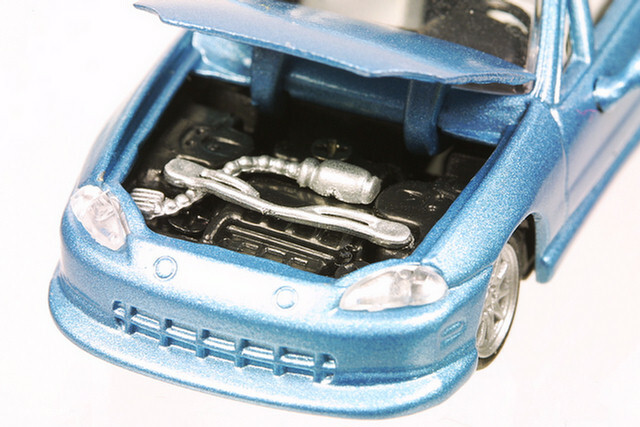 This kits builds a 1:64 Honda Del Sol that is already in modified form sans the strut bar that did not fit. Despite the labelling on the parts packaging, there really isn't a stock 1:64 model. 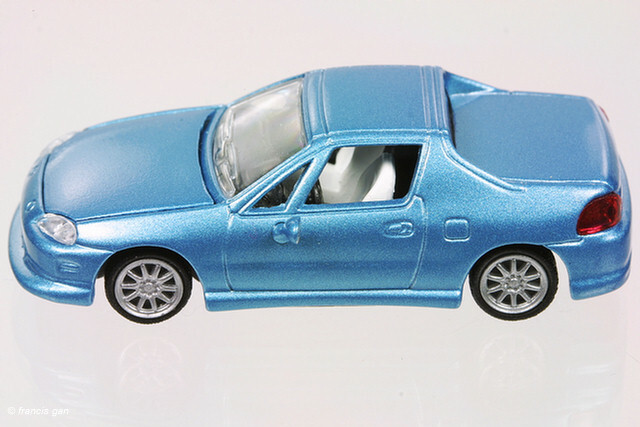 The details on the 1:64 Del Sol are typical of the 1:64 Modifiers - inside rear view mirror, separate plastic lenses for the tail lights and headlights (though the fogs were part of the casting), side rear view mirrors of the correct configuration, roof panel lines and B-pillar lines, accurate undercarriage and engine detail. The modified parts include the front, rear and side skirts that were casted as part of the body, aftermarket wheels and the strut tower bar that did not fit. Various color combinations of the decals were included - which I chose not to apply in fear of having to deal with the number of permutations I would have to have. The only major thing is keeping track which size/color of screw to use when. As with all the Modifiers kits, you get the option to use as many or as few of the modified parts as you want. In my case, I follow my routine of having one stock version and one modified version - meaning that, as usual, I need to obtain 3 of every box. 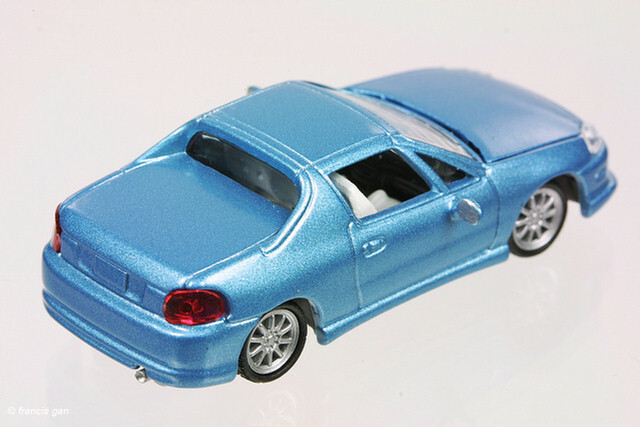 The 1:64 version already modified in terms of a bodykit. Here's a variation of the 1:64 version with parts from a Civic kit.